ETI uses the highest quality, maintenance-free, immobilizedelectrolyte, lead-acid batteries in all of its Rugged Power™,WorldPower™and Military Power® UPS products. However as with all lead-acid batteries, there is an internalself discharge that will over time discharge the battery when not beingcharged. Three basic factors effect the shelf life of batteries: the chargestate when stored, the storage temperature, and the length of time storedwithout being recharged. A battery should never be stored in a dischargedstate, otherwise it will form lead sulfate that permanently damages thebattery. If a battery is stored fully charged at 68°F (20°C), then it would require arecharge at least once every six months to maintain its design life. If thestorage temperature is 88°F (40°C), the storage time between supplementary charges is less thanthree months. With some projects stretching out over many months, maintainingthe charge state of the batteries in the UPS can be a problem. Secondly,attempting to stock spare battery packs or modules for deployed units becomesan even more difficult task since they do not have their own charger like theUPS. Designed for either in a rack or on a bench top, the ETI0001-1151 Charger/Conditioner isideally suited for periodic or continuous maintenance of the batteries in theUPS as well as spare Battery Modules. 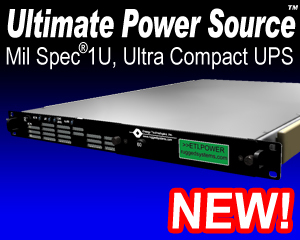 The ETI0001-1151 is specifically designed to support ETI UPS products from 1.0 kVAthrough 6.0 kVA, including the JMCIS, DTC-2, TAC-3 and TAC-4 UPS. Theheavy-duty chassis, occupying only 3.5” of rack space, has rounded metalcorners and rugged handles, aid in safe handling. Internally, all majorcomponents are well secured and electrically insulated to prevent damage due toshock and vibration. The front panel meters and LEDs keep the operator informedas to the unit's status including charge voltage, current, and charge state.All controls and protective devices are brought to front panel and are recessedto prevent damage or accidental operation. The rear panel provides locking connectors for the input and output power. The four output connectors useadapter cables to interface directly with the UPS units and/or with the sparebattery modules. An output selector switch allows the operator to choosebetween the three nominal outputs. Output current is specifically regulated foroptimal battery life, including compensating for ambient temperatures. In addition to maintaining the correct charge on the battery, the ETI0001-1151 has a Battery Conditioner Section. Battery Conditioning isinitiated by pressing a switch on the front panel. This starts a programmedcycle beginning with the first battery connected. It performs a gradualdischarge of the battery to a specific level, then begins recharging thebattery. This discharge/recharge cycle serves to freshen the battery so that itcan perform better on demand. Once it has completed this cycle on the firstbattery connected, it starts the same cycle with each subsequent batteryconnected. The internal input transformer provides galvanic isolation with provisions for both domestic (115 VAC, CONUS) and international (230 VAC, OCONUS) input voltages. The autoranging input voltage selection allows inputting either 115 VAC or 230 VAC without having to open the enclosure. The input switch and the galvanic isolation transformer provide a double pole isolated source for all installations including shipboard systems or overseas locations where phase references and grounding are not consistent. Overall,the ETI0001-1151 provides a reliable yet simple solution to the issue of maintainingUPS batteries while in storage.